1 A third (34%) of Americans liked or loved doing their taxes, according to the survey we conducted at this time last year. Of course, that left 56% who didn’t like the annual exercise including 26% who hated doing their taxes. Among those who liked doing taxes, the largest share said it was to get a refund followed by those who said they didn’t mind or prided themselves for being good at. The IRS says the average refund so far this year is $2,792. 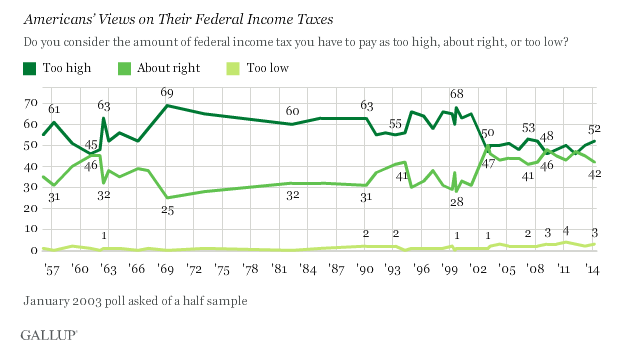 2 Americans, by a 52% to 42% margin, think their taxes are too high, according to a new Gallup poll. Those saying taxes are too high have hovered around that percentage for more than a decade. But prior to 2003 — before the tax cuts passed during the Bush administration — 69% had said the federal bite out of their incomes was too big. 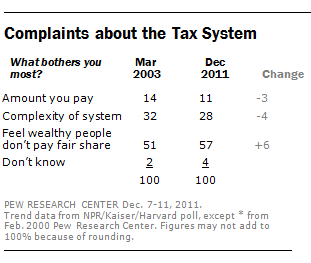 3 While many Americans may think taxes are too high, a majority of them (57%) say their biggest beef with the system is they feel the wealthy don’t pay their fair share, according to a Pew Research survey in 2011. A CBS News poll conducted in January found yielded the same result: 57% of all those surveyed thought upper income Americans paid less than their fair share. 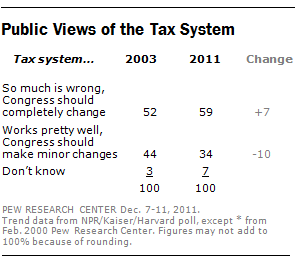 4 Six-in-ten (59%) of Americans say that so much is wrong with the tax system that Congress should completely change it, according to a 2011 Pew Research survey. Just about a third (34%) said the system worked pretty well and that only minor changes were needed. That view crosses partisan lines with 60% of Republicans, 55% of Democrats and 63% of independents calling for a broad overhaul. 5And last, but not least, the tax collector itself, the IRS, does not make Americans feel warm all over. We tested 13 government agencies in a survey last fall, and the IRS ranked at the bottom of the list with 51% expressing an unfavorable view of it while 44% regarded it positively. It was the only one of the agencies where a majority did not have a favorable view.